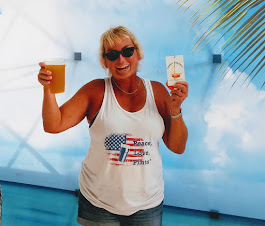 Have you ever visited a bar or restaurant where you found a beer that you had been waiting to try, and, after your tastebuds were deliriously happy from that pour in the pint glass, you then wished that you could take some of that draft beer back home with you? (in an appropriate sealed container, of course). 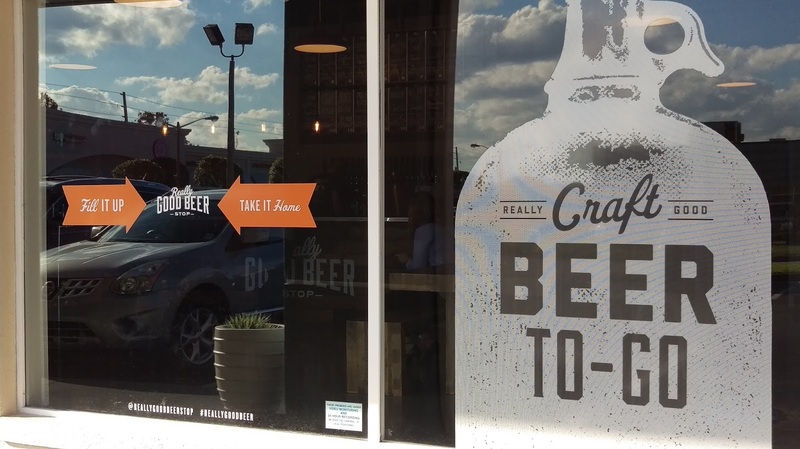 What if there were a place where you could not only get "really good" craft beer "to-go," but you could also try it before you buy it? 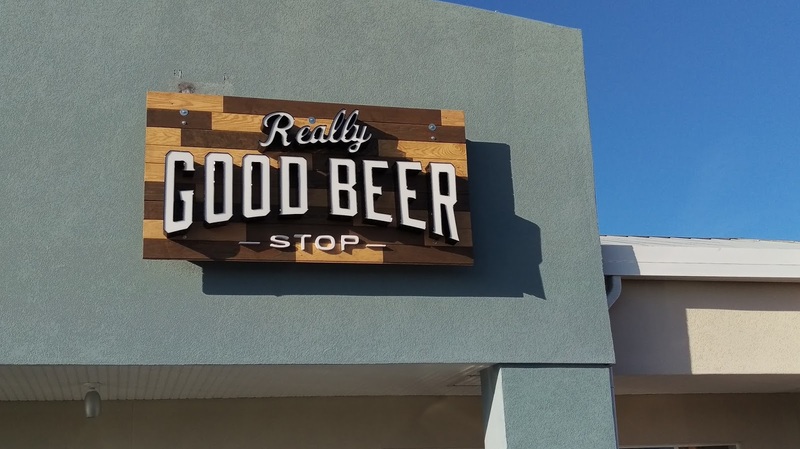 Say Hello to Really Good Beer Stop in Jacksonville Beach. One look at the exterior of the storefront, and you know that you've come to the right place. Walk inside the store, and you might first notice that there's a contemporary functionality to the place. 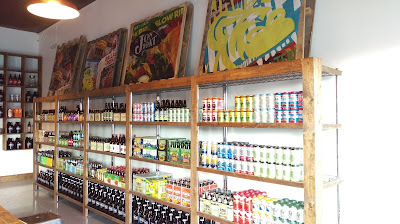 The artwork and decor incorporate different beer labels and beer terms in a fun, edgy way. It's a large space with a bar straight ahead that features 20 taps. 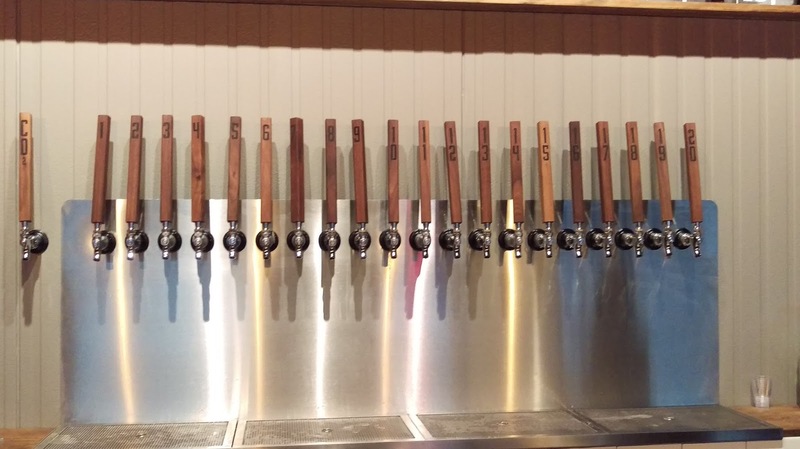 What's on tap, you ask? Check out the chalkboard -- different styles of beer for whatever suits your taste, from lighter to hoppy to dark. You'll also notice that the selection includes beer from local Jacksonville and other Florida breweries, in addition to those which distribute regionally and nationally. That tap list changes, and it's also on the store's website. 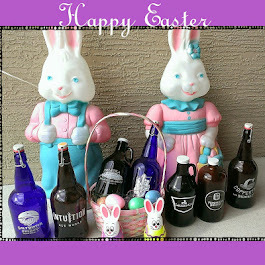 Packaged beer is waiting for you on the shelves along with some that are already cold. 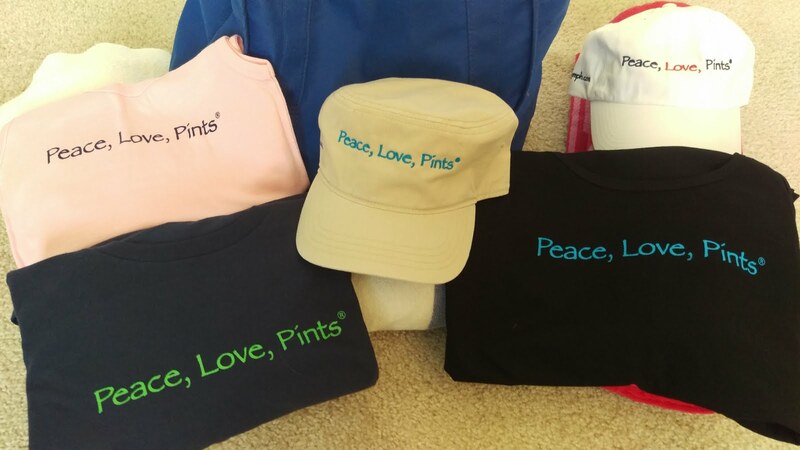 The store also features merchandise, such as shirts and pint glasses (actually they're 20 oz glasses), for sale. 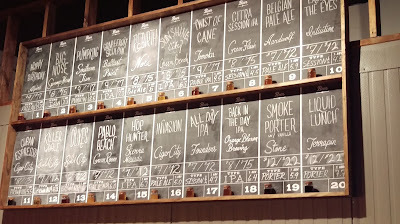 It's a craft beer retail store that not only offers its customers choices of really good (see what I did there?) popular beer in pre-packaged bottles and cans, but owners Tim and Angie Brack are looking to provide a craft beer "experience." Well, what does that mean? I don't know about you, but I'm thirsty just thinking about all of this. 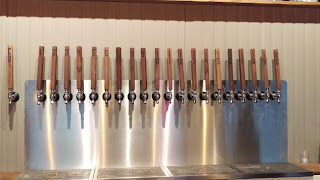 Remember those 20 taps? 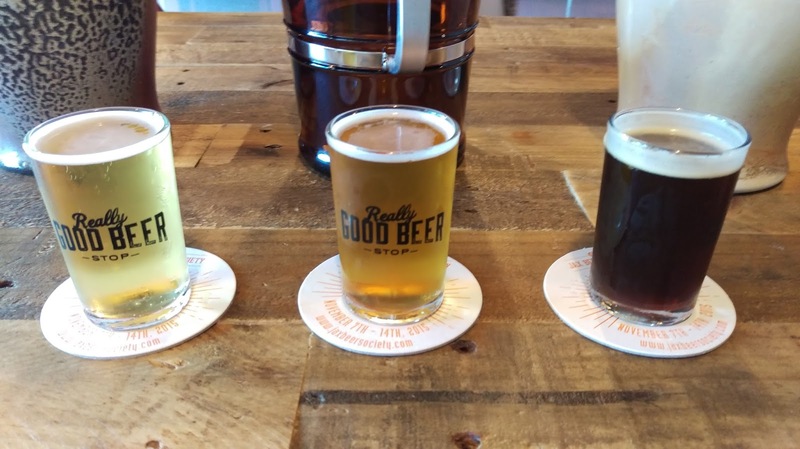 For starters, you can order a flight of three 4-ounce pours for $5. 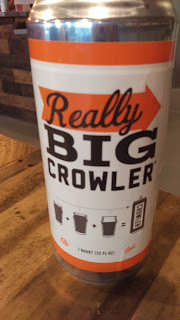 Then, you can decide which one (or more) to take back with you in a 32-ounce or 64-ounce growler, or a 32-ounce "Crowler®" (more on that later). 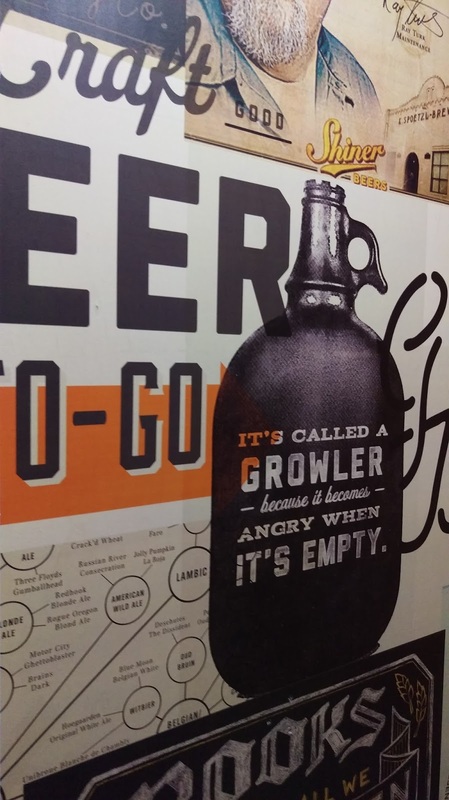 Got a growler already? Bring it in, and get it filled. 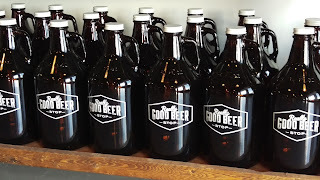 Yes, they will fill growlers from other breweries, too. 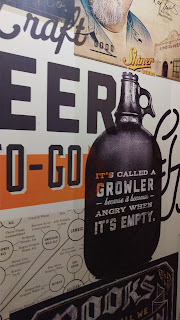 So, what's in my growler (photo above)? 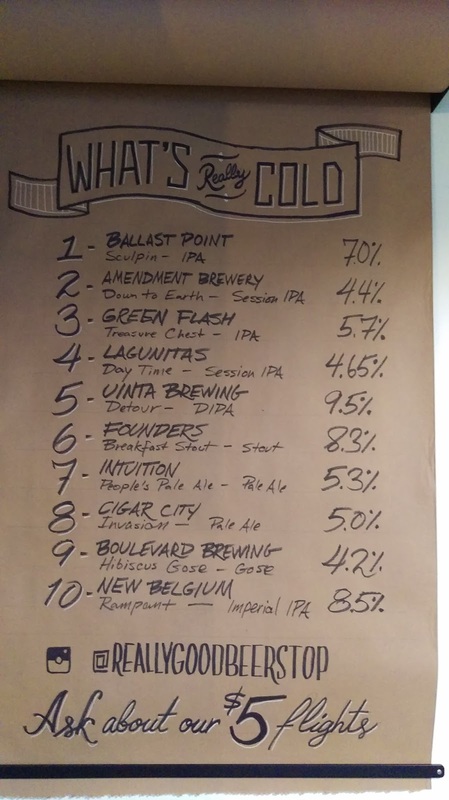 How does 64 ounces of fresh-from-the-tap Ballast Point Grapefruit Sculpin IPA sound? (No drooling on your computer or phone, ok?) You can probably see what's going on here now. 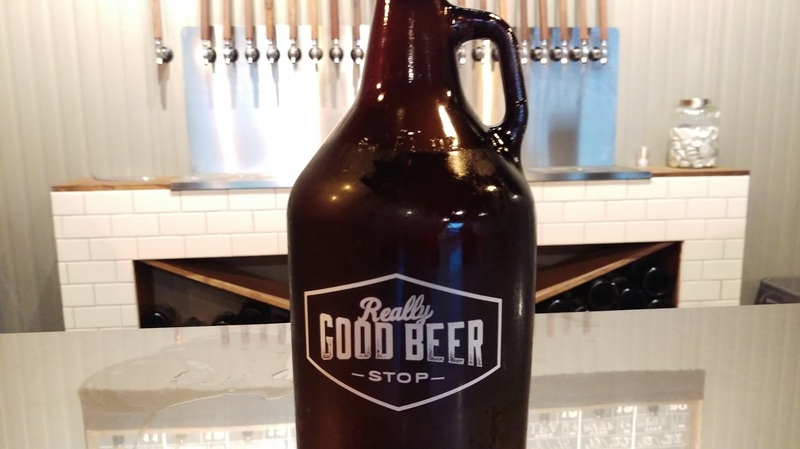 Sure, it's a retail craft beer package store, but it's also got really good draft beer TO-GO .... so you will be able to enjoy it at home, or wherever. here's Daniel filling it up! 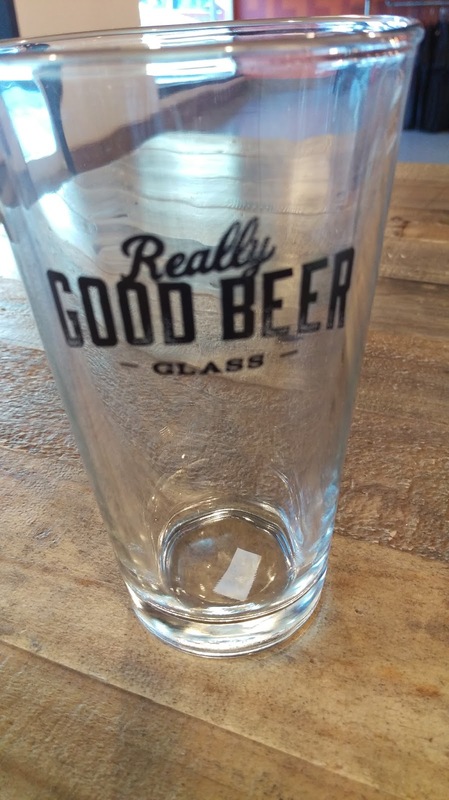 But, wouldn't it be awesome if you could get that really good beer in, say, a big can, to take with you to places where glass might not be the best choice? Yeah, Tim and Angie thought so, too. And, here you go .... introducing to Jacksonville.... the "Crowler®." It's a 32-ounce can of freshly tapped beer, sealed right there before your eyes. And, the beer will stay fresh for about 30 days before opened. I had seen the Crowler cans in the tap rooms of a couple of Florida breweries before: Due South Brewing in Boynton Beach and Playalinda Brewing in Titusville; and Cigar City Brewing in Tampa also fills them. 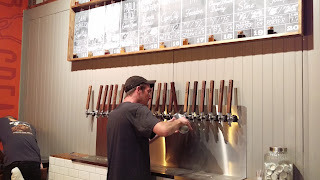 The sealing machine is the brainchild of Oskar Blues Brewery (Colorado), which sells it to other breweries and establishments, such as Really Good Beer Stop. 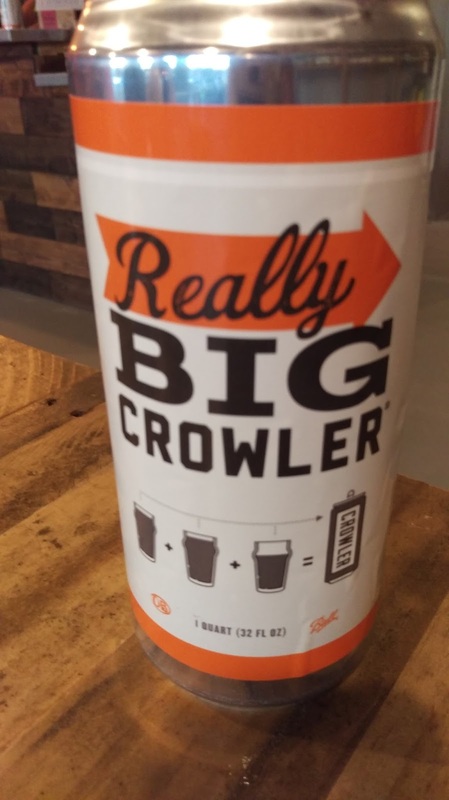 The can itself is manufactured and produced by Ball Packaging, which owns a federal trademark registration for "Crowler" for the cans. The beer is dispensed into the can from the tap, and oxygen is removed by injecting CO2 into the can through a tube. The metal lid is then sealed to the can by the table-top seamer machine. And, that's how you get a can of beer filled right from the tap. When you visit Really Good Beer Stop, you will notice a repeated sound like air being pumped .... you guessed it...someone's getting a Crowler can filled. Unlike the glass "growlers," the Crowler can is only used once and is not refillable. So, do the responsible thing, and recycle it when you're done with it. 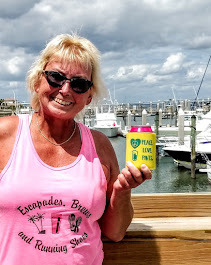 In fact, Tim and Angie said that they have heard reports of many Crowler cans filling the recycling receptacles in Jax Beach! 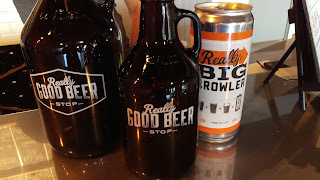 So, yes, you "really" CAN take it with you when you leave Really Good Beer Stop. In fact, they really want you to do just that! (and, let's face it, that's one reason you came here). I had a "really good" time meeting Tim and Angie, and one of the other co-owners, Taylor Harkey, last week. 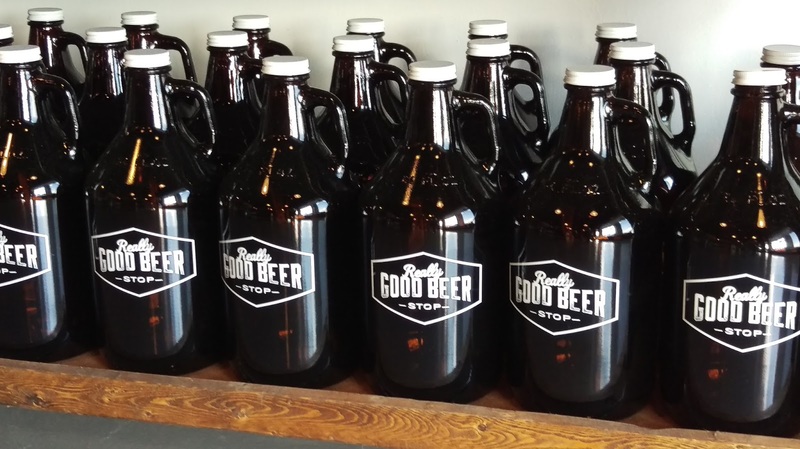 There's usually a backstory when it comes to owners of breweries or beer-related businesses. 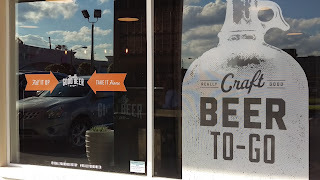 In Tim and Angie's case, they are "just" a couple who are fans of craft beer. The creating, brainstorming and planning for Really Good Beer Stop took about 2-1/2 years. Tim says that he "crossed over" from macro beers after college, and he even experimented with some homebrews. Not only does he have a "regular" day job in the world of medical equipment sales, he's also responsible for ordering the beer, and he even works the bar at night. Tim and some friends built the bar and the shelves. What used to be a t-shirt shop has now been transformed into craft beer shop. Angie has a background in retail, and she also has a full-time job watching two kids, ages 3 and 1-1/2. She's also around the store during the day. 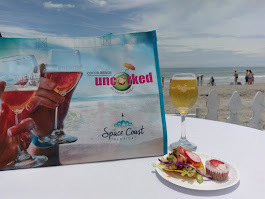 Tim and Angie partnered up with co-owners Autumn Berrang and Taylor Harkey, both of Adjective & Co., an advertising and branding agency located in Jax Beach. Tim and Angie handle the operations, and Autumn and Taylor are the ones bringing you the marketing and social media posts. 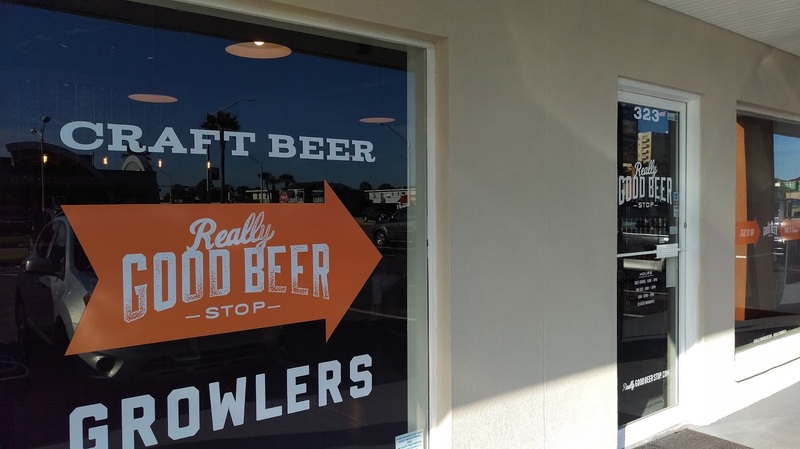 In speaking with Tim, Angie and Taylor, one thing is immediately apparent: they are really excited to bring this concept to the community of Jax Beach and Jacksonville. They were very thankful to the community and Jax breweries for being supportive. You'll notice that they use "really good" a lot around here; and they don't take themselves too seriously! They have additional plans in the works to bring events, such as yoga and beer classes to the store. They want to focus on the community and education, and a membership/loyalty program is in the works, too. You'll probably even see some music and local bands performing here in the future. They're looking at purchasing some additional seating to run along the glass window. And, that big wooden table in the store where you can sit and enjoy your beer? That's Angie's dining room table from their prior residence in Atlanta (they're from Florida, but moved to Atlanta for a time, and now they're back). And, look out for some really good Holiday ideas, too. 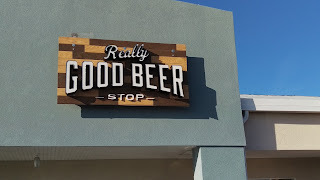 Really Good Beer Stop has only been open about a week -- the Grand Opening was Saturday, October 24 at 11am, following a soft opening the Wednesday before. 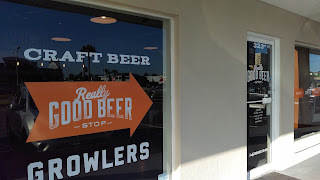 Really Good Beer Stop is located at 323 - 10th Ave N., in Jax Beach, right along 3rd St., and there's even a parking lot. Its hours are Tuesday-Thursday, 11am-9pm; Friday/Saturday, 11am-10pm; and Sunday, 12-5pm; the shop is closed on Mondays. 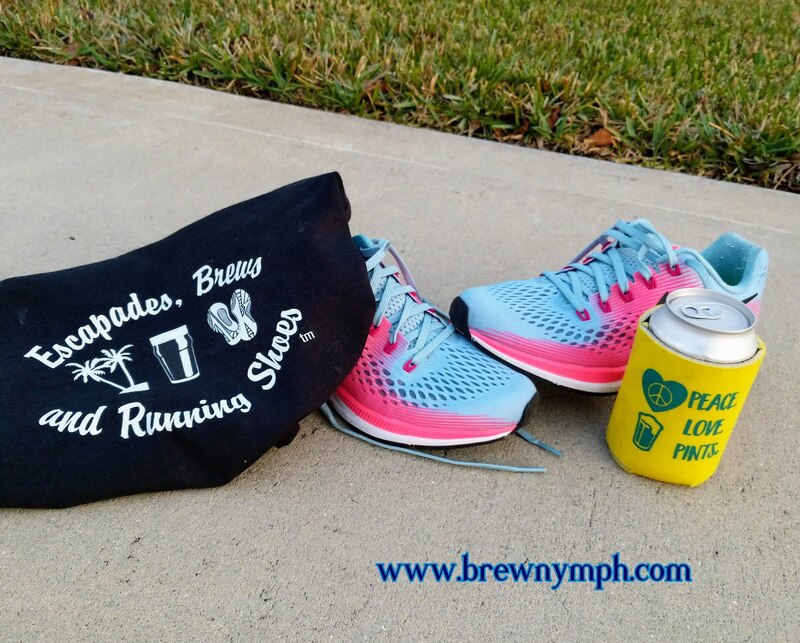 Follow the store on social media and sign up for its newsletter to stay in the know on upcoming events. I think there's going to be a lot of really good stuff on tap and in store for this place and the local craft beer community. 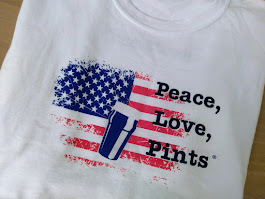 And, that's it this time around..... See you around the Jax and North Florida area somewhere ..... Til next time, Cheers!